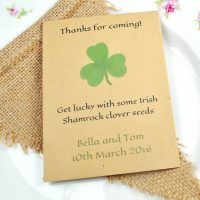 Tags: butterfly seeds, charitable wedding favours, wildflower seeds. 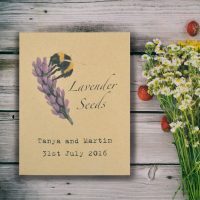 Categories: Charity Wedding Favours, Unusual & Unique Wedding Favours, Personalised Seed Packet Wedding Favours. Who can resist butterflies?! This Butterfly Conservation charity wedding favour is perfect to give to your guests – not only will gorgeous wildflowers be produced but you are also helping Butterfly Conservation in their efforts to help these beautiful, threatened creatures. Butterfly Conservation has raised awareness of the drastic decline in butterflies and moths, and created widespread acceptance that action needs to be taken. Through their conservation work the decline of several of the UK’s most threatened species has been reversed. The charity also runs three of the world’s largest butterfly and moth recording schemes which together have gathered over 30 million records. Charity registered in England & Wales (254937) and in Scotland (SCO39268). 20p from every Butterfly Conservation charity wedding favour sold will be donated to the charity. The seed packet is made from quality recycled paper and contains a mix of around a gram of British-grown British wildflower seeds that butterflies love! 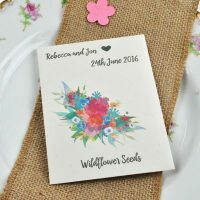 This wildflower seed packet is a very useful wedding favour – you are helping butterflies and the charity that wants to preserve them as well. Please note that the design on these packets does not have room for personalisation.